Gardening is good for you, as long as you don't overdo it. I always tell people that when they visit my garden shop, The Potting Shed, in uptown Charlotte, NC. So many young couples are just getting started on setting up gardens - on patios or small plots in their yards. Of course, what can be good for you can be bad if you do it wrong or if you do it too much. We all know that's true. Plants are the same way. Many medicinal plants have saved lives. Many have also been used to take lives. It's a delicate balance between exactly the right amount used. One amount will heal, while the other will poison. 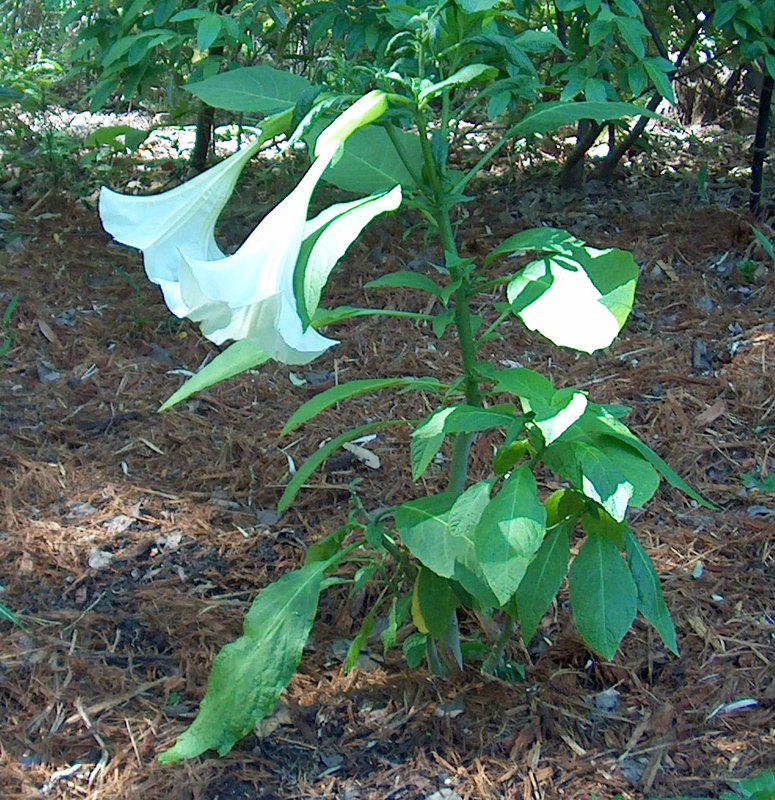 Take Angel's Trumpet, a common enough plant. We grow them easily here in the South. The plant is the botanical basis for the drup Scopalomine. This has been used for generations as a painkiller, particularly in childbirth. Used incorrectly, it becomes a toxic poison that will make someone die a horrible death. It happens more often than we want to think, I'm afraid, with good intentions and with bad. Many plants are deadly poison. Most people don't know what is and what isn't poisonous. That can be bad. Keeping poisonous plants around children and pets can be very dangerous. It can be even worse when someone means to take a life. Oh dear, my Great Dane, Shakespeare, is running through my petunias again. The next time I rescue a pet, I'll make sure it's something small! Peggy Lee Garden Mysteries feature forensic botanist and poison expert, Dr. Margaret 'Peggy' Lee. Coming in October 2012: Buried By Buttercups: A new Peggy Lee short story! Ah yes, so many deadly poisons, so little time!! LOL. Exactly, Haylee! You can't always tell a book by its cover! Yes, Victoria. The trick is to use as many as you can, while you can!